Everton Football Club and its official charity, Everton in the Community, has an ongoing commitment to tackling the stigma around mental health and is rolling out an accredited training programme across the Club to equip all staff with an understanding of mental health. 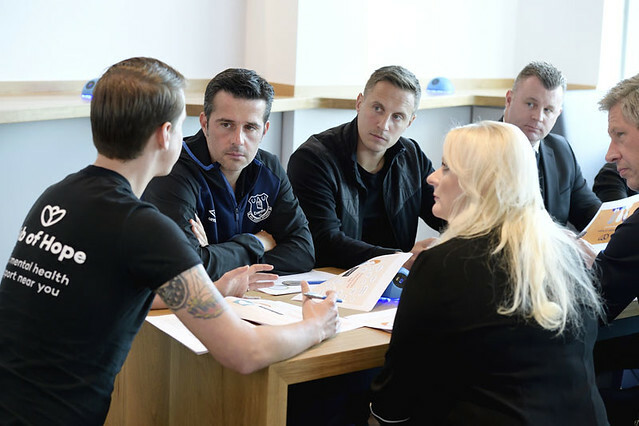 To mark World Mental Health Day (Wednesday October 10), Everton CEO Professor Denise Barrett-Baxendale, first-team manager Marco Silva and club captain Phil Jagielka have undertaken a mental health awareness training session as part of the Club's ongoing work to promote positive mental health. The trio joined other senior Everton figures, including Director of Football Marcel Brands, in undertaking the 'Ambassadors of Hope' training, which was delivered by Liverpool-based national mental health charity Chasing the Stigma and its founder, Evertonian Jake Mills. The session, which took place at the Club's USM training ground, provided the group with an understanding of mental health and how best to identify the signs that someone may be suffering. They were also given guidance on how to effectively signpost individuals to support provision using the online resource, The Hub of Hope, and advice on dealing with crisis situations. Everton Football Club and its official charity, Everton in the Community, has an ongoing commitment to tackling the stigma around mental health and recently launched a new mental health-focused campaign to raise funds to build a permanent facility – called ‘The People’s Place’ – in the shadows of Goodison Park. With a fundraising target of one million pounds, Everton in the Community aims to develop, build and maintain a new purpose-built facility that will become a delivery site for programmes and enable signposting to other services. ‘The People’s Place’ will provide an overarching service to anyone, regardless of age, gender or location, to promote positive mental health and deliver support relating to suicide awareness and prevention. 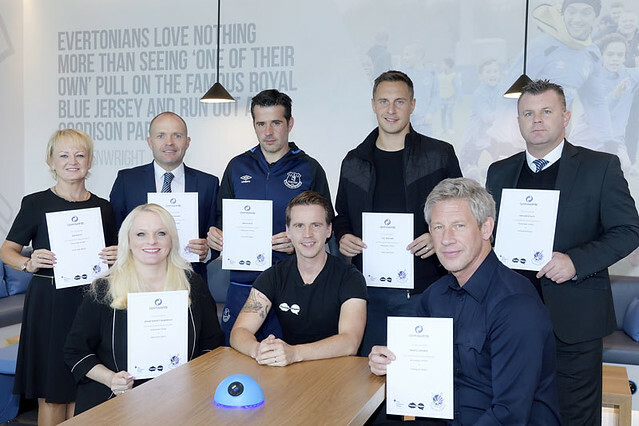 As part of the campaign, Everton Football Club and its official charity has made a commitment to equip all its staff with an understanding of mental health through accredited training, with Everton CEO Barrett-Baxendale and some of the Club’s most senior officials becoming the first group of staff to complete Chasing the Stigma’s ‘Ambassadors of Hope’ training programme, underlining the importance the Club places on the training. There was also an opportunity for the group, which included Club Ambassador Graham Stuart, People Director Kim Healey and Director of Marketing, Communications and Community Richard Kenyon, to put their own questions forward and share opinions and ideas about the development of 'The People’s Place' facility. Chasing the Stigma aims to remove any negativity associated to mental illness by using first-hand experiences to disarm and normalise the topic in order to change the way society approaches mental illness. Speaking after the training session, Everton CEO Denise Barrett-Baxendale said: “When you are provided with the statistics that reveal both the number of young people taking their own lives each year and the number at risk of suicide, it is absolutely staggering. As a football club, we are determined to reach out and help. “We need people to come in and receive support. That means overcoming any concerns related to embarrassment or stigma that may be preventing people seeking help. Having a purpose-built facility that provides this opportunity, just as we would with people with physical health, is essential. We want people to know there is an opportunity to secure positive mental health support and that it is okay to say, ‘I’m not feeling too good today’. “This is a real community issue and therefore we should be reaching out as a football club to help the most vulnerable people, using the power of football to say, ‘We all have mental health, as we have physical health, and please come to speak to us in order for us to support you'. Club captain Phil Jagielka added: “The statistics around how many people need help - or who, very sadly, don't receive help in time – are alarming and it opens your eyes. Jake coming here to share his own personal experiences and guide us through the protocol - and what to do and how to be helpful – ensures we are better equipped to help someone in need. It’s being there when someone needs you and making sure you ask the right questions. Chasing the Stigma founder Jake Mills said: “What we try to do through the Ambassadors of Hope training is to create a baseline level of understanding about mental health. What we’re not trying to do is make people experts, but we don’t believe you have to be in order to have that level of understanding to know what to do in those situations. Everton in the Community has been delivering award-winning, life-changing and life-saving mental health provision across Merseyside for more than 10 years, supporting more than 5,000 individuals with bespoke programmes for those in need. The charity’s existing long-running mental health-focused programmes and services will continue to be delivered and developed during the fundraising campaign. A community consultation will take place to ensure that the new building meets the extensive needs and requirements of the local community and brings a significant impact to people’s lives through a diverse range of activities and services. The People’s Place will be built right in the heart of Liverpool 4 and the new mental health facility, subject to planning permission, will be positioned within the Goodison Campus adjacent to the £1.2million People’s Hub on Spellow Lane – just 200 metres from Goodison Park. A community consultation will take place to ensure that the new building meets the extensive needs and requirements of the local community and brings a significant impact to people’s lives through a diverse range of activities and services. The club will also work closely with mental health specialists from Chasing the Stigma to ensure that ‘The People’s Place’ will provide the very best and most effective mental health support facilities, as well as maintaining its commitment to tackling the stigma around mental health. Everton in the Community’s award-winning mental health programmes have provided life-changing and life-saving support to people across Merseyside since 2007. The Club and its official charity want to increase access to care through The People’s Place, a proposed open-door facility on the Goodison Campus which will deliver a range of mental health programmes and enable signposting to other services. In the lead-up to World Mental Health Day today, evertonfc.com has published a series of videos and articles to improve awareness of the issue and illustrate the unconditional support available from Everton in the Community to anybody suffering with mental health. Today focuses on Evertonian Jake Mills, founder and CEO of Liverpool-based mental health charity Chasing The Stigma, which has teamed up with Everton on The People's Place project. Watch a video with Jake below or by clicking here, and read the story on how his own battles with mental health fuelled his determination to help others. If you need mental health support or to find out more about The People's Place project, click here. Donate to support Everton in the Community's life-changing work here. Jake Mills stands on Spellow Lane and scans a rolling patch of grass. He pulls his jacket taut, shielding himself from an October chill. Mills is reaching into his mind’s eye to picture The People’s Place, the mental health facility Everton Football Club and Everton in the Community intend to develop on this unprepossessing patch of land. He peers through slits in the iron fencing wrapped around the site within a toe punt of Goodison Park and can feel and express the importance of this project. Mills talks with clarity and authority about how it will save lives. Listening to him speak with such passion and reason, it is very difficult to imagine this 29-year-old, who is such enriching company, as anything other than the confident, ferociously-driven mental health champion stood here today. “When I first spoke publicly, a number of people came to me and the realisation of how many others were struggling gave me a purpose back and a fire in my belly,” says Mills. Jake Mills has exploded the “bubble of numbness” which once surrounded him. He has dropped the guard which, rather than protecting him, was acting to push this outwardly assured and successful individual further into himself. “I did not know I could be fixed and it was something that could be treated,” he says. Mills knew nothing about depression – nor that he was suffering from the illness in its starkest form – and was blind to the help which existed for those suffering from poor mental health. In 2013, he drove his car to a place he considered a safe haven, where he was discovered by girlfriend Rachael attempting to take his own life. Here’s the thing: Mills made his living from making people laugh. He was very good at his job, too. “The next big thing,” as one BBC critic had it, he shared bills with stand-up luminaries Reginald D. Hunter, Josh Widdicombe and Rob Beckett and in 2010 was shortlisted for the prestigious Leicester Mercury award. “It allowed me to escape from real life,” says Mills. “What wasn’t so nice, was when you stepped off stage and were back to reality. “It is quite a difficult, isolating and lonely job. “People think comedians are going on stage and making everybody laugh and it is the best job in the world. But most of your time is spent on your own travelling. Mills cannot say for certain when his mental health started to deteriorate. How could he when he “did not know what it was”? Mental illness digs it pernicious claws into sufferers and exerts a mighty hold. It is dogged and spiteful. it controls thoughts and encourages damaging beliefs. Mills was gripped by the illness when he was 23 and within 12 months had decided his death would liberate his partner and family from a heavy burden. “I had gone from ‘safe’ adulthood at university to trying to forge a career as a comedian and having to make money,” he says. “All my responsibilities weighed heavily on me. I longed to be a dad and for a future with my girlfriend but was convinced I did not deserve those things. Five years later, Mills is at the vanguard of efforts to “normalise and humanise” the topic of mental illness. In 2016 he founded national mental health charity Chasing The Stigma (CTS), which is partnering with Everton on The People’s Place project. He has a tattoo on his forearm of a lyric from a song by his favourite artist, Bruce Springsteen. ‘It ain’t no sin to be glad you’re alive'. “Music helped me through some of the hardest times,” says Mills. “For a brief stage I felt every lyric Bruce Springsteen had written was for me – part of me still wants to believe that. “Before and during my depression, and certainly before my suicide attempt, I did not know anything about depression, I did not talk about mental health, good or bad. Suicide is the biggest single killer of men under the age of 45 in the UK. Equally, more people than ever are seeking help for mental health problems, a fact indicative of a society with a broader understanding of the subject, agrees Mills. He is, however, armed with statistics which point to a cavernous space in the provision of care. And he is explicit about the substantial role Everton’s People’s Place – which will deliver mental health programmes and provide signposting to other services – could have in closing the gap. “It is really good people are becoming more aware of mental health problems and seeking help,” says Mills. “But there is a lot needs to be done, almost three quarters of the people who died by suicide in the past year, and the year before, were either not known to mental health services or had not been seen for more than a year. “We know there are different reasons for that and the NHS is under a lot of pressure. “That is why projects like The People’s Place are so vital: the grassroots organisations, the places where you don’t necessarily have a waiting list, where you can go in and be around people and receive help. Mills’s lowest point, the day he concluded suicide was his best bet, transpired to be the catalyst for his recovery. He was free from a tangle of lies, concocted to maintain the façade of happiness and impression of a man comfortable with his place in the world. “After my suicide attempt, I could not hide anymore,” says Mills. “I had to face the reality, not only of what I was trying to escape but the impact on my family. “They were supportive, they spoke to me without judging me and did not use it against me, completely contrary to all the things I thought would happen. “They were there for me. Looking back, of course they were there for me. But I never saw it that way when I was ill. That acceptance from my family was the biggest turning point in my life. EitC is in its 12th year of delivering its award-winning mental health focussed programmes and services. The Club’s Chief Executive Denise Barrett-Baxendale views The People’s Place as an opportunity to “enhance and evolve our current provision… to encourage people to talk more freely”. Mills discovered his voice – more pertinently, the power of his voice – as he embarked on his recovery. He spared no detail when sharing his story and is using his experience as a vehicle to advocate greater understanding of mental health problems. His charity aims to remove a stigma which remains attached to the subject. Replace the word stigma with ignorance, he says, and you appreciate the folly of blithely and errantly labelling an illness which, allowed to prowl unchecked, can have the bleakest of consequences. “Everybody has mental health,” says Mills. He explains the bubble; the claustrophobia inside, the crisp air and world of opportunity outside. “Before I started speaking it was like being in a bubble,” he says. “It was like I was living in a normal world but I could not associate with anything, or feel anything. “I was inside this bubble of numbness. “After I spoke out, it was like that bubble had burst. Suddenly I could breathe and feel air in my lungs. As his national media profile grew, so Mills found himself awash with requests for his counsel. A germ of an idea formed in his mind and within two years Chasing The Stigma was launched. An Evertonian and long-standing Paddock Season Ticket holder, his charity’s alliance with the Club seems preordained. “I tried to make something of what I had gone through,” says Mills. “I realised when I was speaking publicly a huge responsibility came with that. People were asking me for help, so I wanted to formalise that. “We created Chasing The Stigma, and through that we created Hub of Hope [in July 2017], a national mental health database which makes it as easy as possible to find help. “I did not plan on any of this, it is an accidental journey. But we are going with it and we are at a stage where we can offer life-saving support to people across the country. “We are very lucky to be able to partner with Everton on The People’s Place project. “What better way to tackle that stigma around mental health than to use heroes, idols, a football club that means so much to so many people? Mills wrote the Ambassadors of Hope training programme, designed to educate on mental health and which is being rolled out to all employees at Everton FC. He delivered the first session, addressing a group which included Manager Marco Silva, Professor Barrett-Baxendale, Everton captain Phil Jagielka, Marcel Brands, the Club’s Director of Football, and EitC Chief Executive Richard Kenyon. The motivation for this element of Mills’s charity is underpinned by memories of the wall of lies he constructed at the height of his illness. He wants people to recognise if a family member, friend or colleague is suffering with, or susceptible to, poor mental health. “I was creating an illusion I was fine and happy, putting on a mask to hide away my inner turmoil from the people who wanted to help me,” he says. “I felt alone despite having a lot of people around me. The more my girlfriend or parents said, ‘We know something is wrong, how can we help you?’ – it pushed me further away, because I did not feel I could be helped. “I wanted to protect them as much as myself. “The more they would ask, the guiltier I would feel. And the more people worried about me, the more of a burden I felt I was to them and their lives. “I was acting differently. All the signs were there but not necessarily obvious. “That is why the Ambassadors of Hope training is so important, we are trying to aim it at people who need to be vigilant, encourage them to have conversations and look for symptoms. “I was stopping going out and cutting myself off from friendships. Making excuses to not commit to plans or see people. “I was erratic and emotional, particularly with paranoia and anger. Mental illness does not discriminate. It does not pick its victims because of their age or race, their gender or individual circumstances. “The People’s Place is not just about Evertonians,” says Mills. “It is about the whole community. We want to get the message out to the community around Goodison: We all have mental health and should be talking about it. “Everton is a club doing things. They are not talking about it, they are actually doing it. It is not gesturing, it is not box-ticking, it is not lip service, it is actually, ‘Let’s create something which will make a difference to the community. “If we are going to save lives and reduce the numbers of suicides, then having somewhere people can go to get help is absolutely vital. “The People’s Place is beyond exciting and I cannot wait to see it. Mills, once upon a time, saw no way out. Now, though, the reality is clear. He was born to run, he harbours no guilt about the joy he derives from life. Rachael is his wife and mother of Jake’s three-year-old son Teddy. Mills is performing his comedy routines again. He laughs, a belly laugh. 'It ain’t no sin to be glad you’re alive’. “The lyrics are quite powerful,” says Mills, explaining the inscription on his body. “I think we forget to acknowledge the present and should not feel guilty about being happy to be here and being ourselves. He wants to shatter the “myth that people don’t want to talk about mental health”. It is worth absorbing the words Mills chooses to convey his overarching message. Mental illness came for Jake Mills. But he is fighting back with a vengeance – and determined to have the last laugh.